The famous Chinchorro mummies, which have remained preserved in Chile for more than 7,000 years, are now under threat from increased levels of moisture. Humid air is allowing bacteria to grow, causing the mummies' skin "to go black and become gelatinous," said Ralph Mitchell, a professor emeritus of applied biology at Harvard University in Cambridge, Massachusetts, who examined the rotting mummies. The rapid deterioration began within the past 10 years, and has affected some of the 120 mummies that are housed at the University of Tarapacá's archeological museum in the northern port city of Arica, the researchers said. It was unclear why some of these mummies started degrading into black ooze, so Chilean preservationists asked Mitchell and his colleagues to study the microflora, or the bacteria, on the mummies' bodies. Unless the mummies can be kept under the right temperature and humidity conditions, "the native microorganisms are going to chew these guys right up," Mitchell said. In their experiments, Mitchell and his team adjusted the air's humidity levels from dry to damp, looking at how each humidity level affected the skin of the mummies. The researchers did their initial experiments on pig skin, to limit the amount of mummy skin they needed to use. Humidity levels in the region of the museum have increased recently, Sepulveda said. Normally, Arica is arid -- it is located near the Atacama Desert, the driest desert in the world (outside of Earth's polar regions).Chile's changing climate may explain why the mummies are disintegrating, said Marcela Sepulveda, a professor of archaeology at the University of Tarapacá.They found that the skin began to fall apart after 21 days at high humidity. To save the mummies, the museum will need to keep the humidity in the room where the mummies are stored between 40 and 60 percent, the researchers found. Higher humidity could cause more degradation, and lower humidity could damage the mummies' skin, Mitchell said. "It hasn't rained in parts of that desert for 400 years," Mitchell said. But in the past 10 years, fog has come in off the Pacific, possibly because of climate change, Mitchell said. And "because there is more moisture around, the mummies have begun to disintegrate," he said. 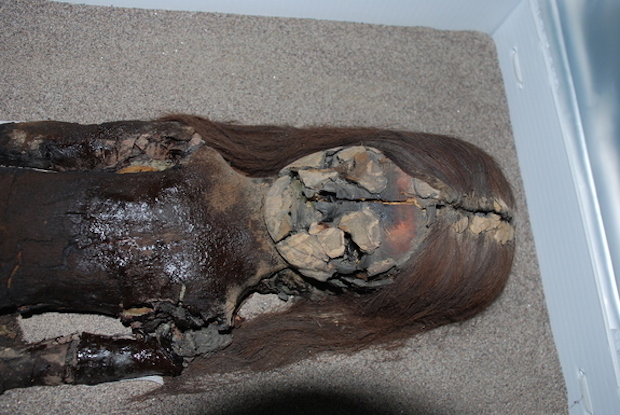 Efforts to preserve the mummies are underway. The museum's researchers are measuring and adjusting the humidity, temperature and light in the room where the mummies are housed on a daily basis, Sepulveda said.